The winter wedding season generally draws a large influx of Bangladeshis living abroad and their foreign friends, often visiting the country for the first time. Bangladesh, with its cacophonies and colours, and by virtue of being one of the most populous countries in the world, promises an experience like nothing anyone would have experienced in the west. So we strive to showcase the best of Bangladesh, organising elaborate trips to the wilderness of the Sunderbans and the tea gardens of Sylhet. In doing so, perhaps, we spend a little less time honouring our own city – something I realised as I lay in a biriyani-induced stupor listening to my friend Katy speak ruefully about being ferried around Gulshan in cars, unable to get a sense of the real Dhaka. Heeding this as a call to action, I frantically racked my brains trying to come up with something suitable in the limited time that we had available before her flight. 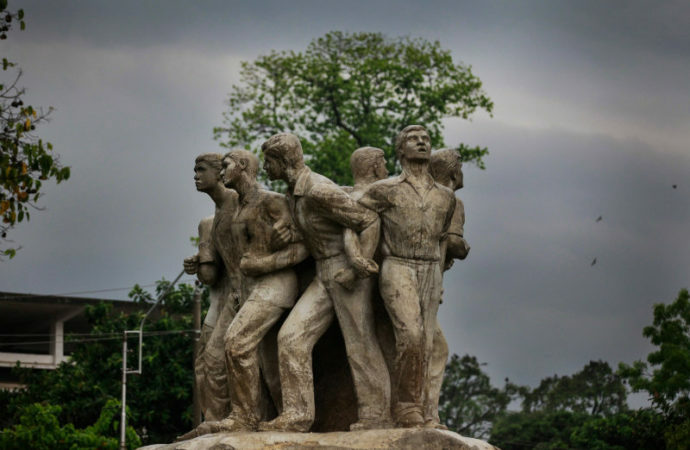 Walking around Dhaka University seemed like a natural fit for the group which mostly consisted of academics and art enthusiasts, and thus, the “Whirlwind Tour of Dhaka University” was born. We began at Charukola or the Faculty of Fine Arts, walking amidst the sculptures hidden in the foliage and peering inside classrooms to watch students transform empty canvases into masterful works of art. 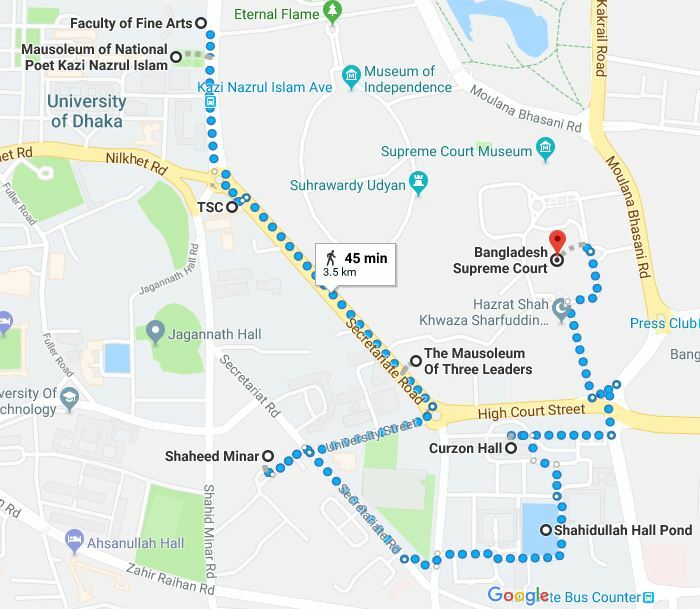 Charting a route down Kazi Nazrul Islam Avenue and Secretariat Road, we walked past the rebel poet’s tomb, the student hub of TSC and the Mausoleum of Three Leaders. In the course of dodging hawkers and stray dogs, and fending off the temptations of the delectable street food, I tried to explain a little bit of about the importance of the area we were in, and the roles each land mark and individual played in our country’s embattled history and identity. We paid our respects at the Shaheed Minar, where we also engaged in the very Bengali pursuit of discussing politics and nationalism, all while demolishing a bag of warm, toasted peanuts. On our way to Curzon Hall, and while negotiating the frenzied traffic, we took a wrong turn. A lucky mistake as we ended up meandering through the intricately detailed halls of residences of Shahidullah Hall, past clotheslines bedecked with freshly washed jeans and a mossy pond around which young couples held clandestine meetings. The century-old Curzon Hall, with its domed turrets and resplendent in red, did not disappoint. Keeping to the architectural theme of the British Raj, we continued on to the High Court, the final destination of our brief tour. I hope I was able to give my friends a glimpse of the real Dhaka, its rich heritage and its inhabitants. Intrepid’s Urban Adventures offers a tour of Dhaka after sunset – Dhaka After Dark. 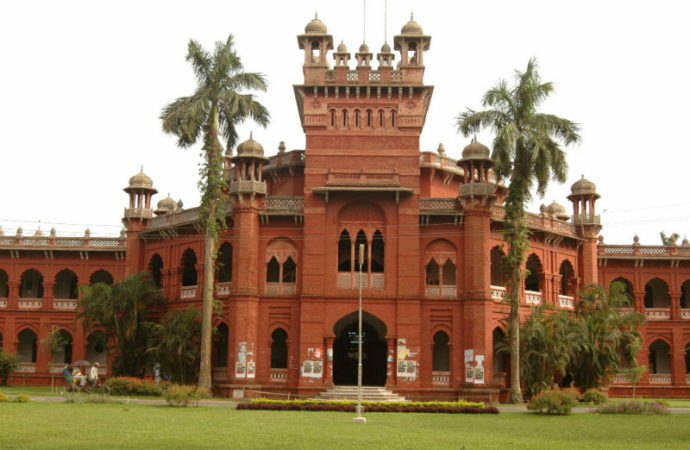 The tour focuses on historical sites in the older part of town and Dhaka University campus. Guides encourage groups to wander amongst the myriad of food stalls sampling the local fare and chatting with locals. It also throws in a performance at the national theatre. 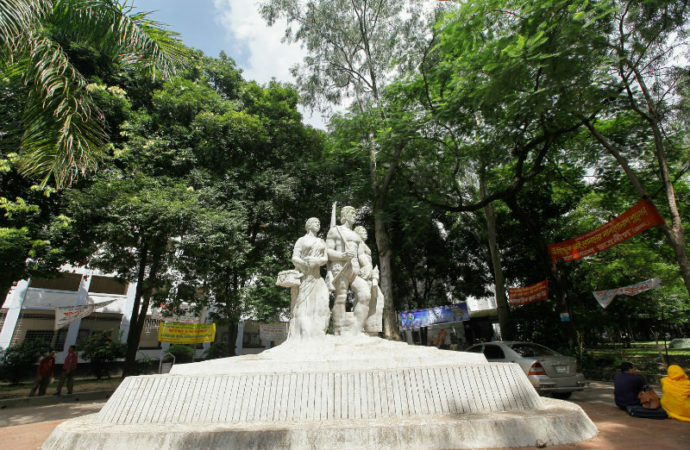 Dhaka Walk has created an array of half-day walking tours to portray the history and diversity of Dhaka city. Instead of trying to tick off all the major sights in one go, the guided tours concentrate on small chunks of the city. There are separate architectural tours of heritage buildings and ruins, along with one that solely focuses on Louis Kahn’s genius, the Parliament building and surrounds. For those more interested in getting a glimpse into the lives of Old Dhaka residents, there is a tour that covers the tiny laneways, where groups can meet residents and learn about their lives. The Urban Study Group (USG) is not a tour company, but a voluntary group of campaigners who work towards the conservation of Old Dhaka’s heritage buildings. The Group is comprised of architects and local volunteers knowledgeable about the city’s Mughal architecture. Architect Taimur Islam, founder of USG, describes how the walking tours came to be. While documenting the oft ignored heritage buildings and campaigning for their preservation, the Group began inviting members of the civil society to accompany them on their expeditions. Over the past decade, they’ve guided tourists and members of the public through the warren of lanes in Old Dhaka, educating them on the city’s Mughal past, its culture and architecture. Currently they run four tours focusing on the following areas – Farashganj, to view the 18th and 19thcentury mansions built by Hindu Zamindars; Armanitola-Chawkbazar, covering historic monuments and Mughal-era mohallas (traditional neighbourhoods); Narinda, which includes a visit to a 400-year-old Christian cemetery and the exotic Baldah Gardens, and a walk along the banks of the Buriganga River showcasing two Mughal Caravansaries – Boro Katra and Choto Katra. Tours are currently conducted on weekends for a small fee of Tk. 500 which goes towards financing their operations. GPSMYCITY is an app that offers self-guided walking tours. The app provides a number of different routes around Dhaka city, complete with maps and GPS navigation. In addition to a Southern Dhaka tour which covers Old Dhaka, the app has custom walking tours to cater to a variety of interests. These range from museums and art gallery tours, a shopping trail, a walking tour to cover key places of worship as well as one covering prime government buildings. The cherry on top? The app works offline so no data plan is required when you’re on the go. Triip.me is a website via which tourists can book experiences with locals. Unlike traditional tour companies, the website allows anyone to create a tour package and sell it to registered users. There are a few passionate Dhakaiites who’ve capitalised on this and a quick search will reveal a diverse range of tour itineraries, many of which are free.